GET THE BJS RADIO APP! ​Listen to The Messenger Morning Show, hosted by Craig Reid with Al "Tree" Wright and Joan "Joanie Moochachie" a.k.a. "The TechChick" McCullough Saturday and Sunday at 10 am and 7 pm! CHECK OUT A LIVE RECORDING! SPRING FEST 2016 TICKETS ON SALE NOW!!! 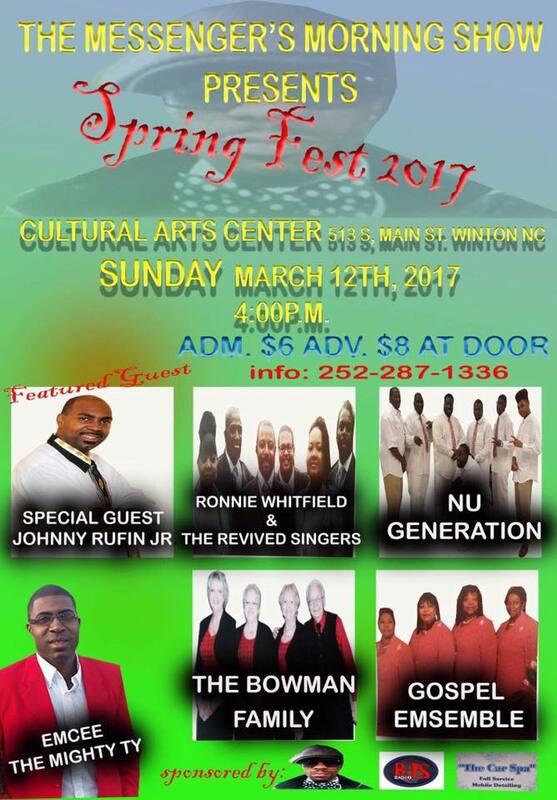 TMMS is hosting Spring Fest 2017 at the Cultural Arts Center Sunday, March 12, 2017 at 4:00 pm. Tickets are on sale. Contact Craig Reid at 252-287-1336 to get yours today! Do you want to be on the show? Would you like to have The Messenger emcee your event? Contact Mrs. Jennifer Gatling Sharpe at 571-213-1332 or contact Craig Reid directly at 252-287-1336 for booking!